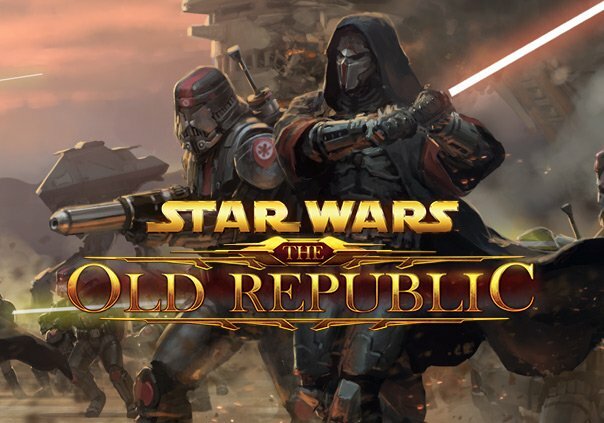 With the standard rotation being kicked off by Guilds of Ravnica, I figured if I was going to bring Magic: The Gathering to Sci-Fi Bloggers, this would be the time. 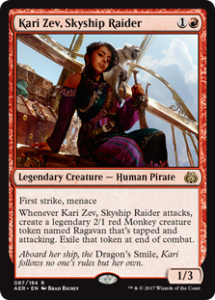 And, today, I have a deck tech for all you RDW players. 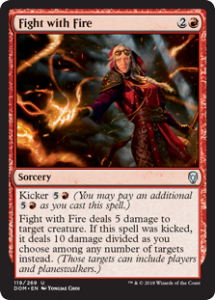 More specifically, an updated Flame of Keld deck. 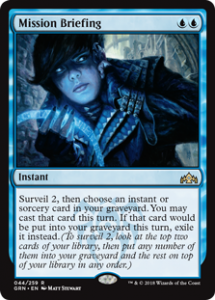 But—I somehow hear you object through the screen—with a good chunk of the cards rotating out, how could the deck still work? Well, I’d argue that it’s just evolving. 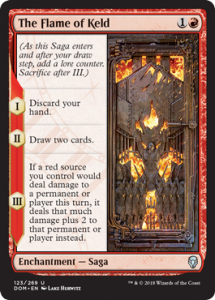 The Flame of Keld is still a legal card and will be for a long time and still works as a red engine of doom for anyone who stumbles against it. But, what would such a deck look like? 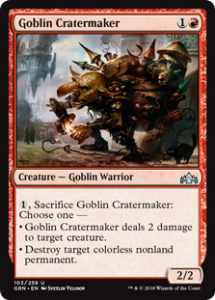 Well, sadly, I’ve had little time to test the exact numbers, but I wanted to discuss a few ideas for replacement cards and go over the logic behind them. 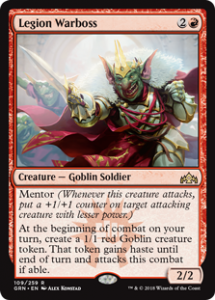 As standard solidifies, Goblin tribal may take the spot as the de facto red deck, but I still think there’s potential here. This seems devastating, yeah, but I’d argue we can deal without them. 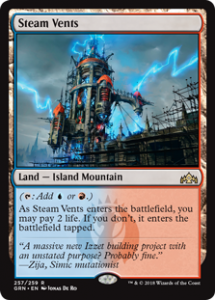 Let’s go over the 3 most exciting new pieces I want to slot in—likely 3-4 copies main board—to make a new version that still abuses The Flame of Keld. The community is still figuring this one out, but, if the fluctuations of the price for singles are any indication, some are seeing the card’s potential. 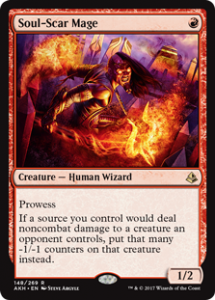 One of the most devastating aspects of the original Keld deck was that Bomat could refill your hand after you used Keld. 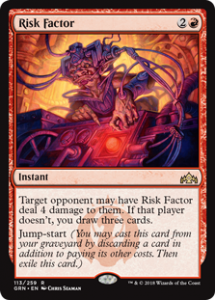 Well, not only can you discard Risk Factor and still use it after a stage 1 Keld, at the final stage it either burns for 6 or draws you 3 cards—likely containing some other cheap damage source. 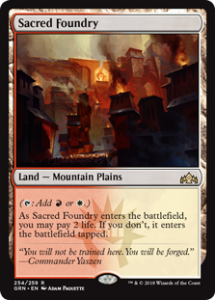 Multiple copies become ridiculous even before you go off with Keld and otherwise dead mountain draws just become fuel for increasingly hard decisions for your opponent. 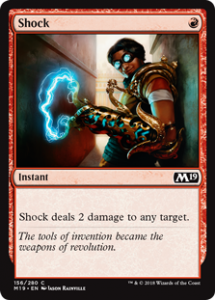 Jump-start as a mechanic works so well with Keld that I’d almost consider the terrible Direct Current as a 1 or 2 of to round out a burn package. People are going nuts for this card everywhere and I see why. In Keld, its power is in the fact the tokens just keep coming. Though Legion Warboss has mentor, I don’t see him swinging much himself unless your opponent is wide open. His function is to apply increasing pressure and make it even harder to survive a stage 3 Keld. 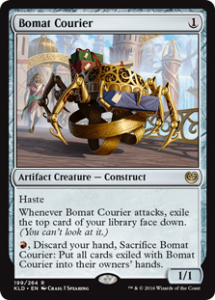 I’m sure someone is going to figure out some infinite or one-turn-kill combo in standard or modern with this guy, but, in the meantime, I’m mostly interested in his first line of text. 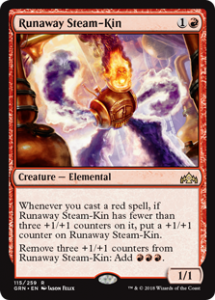 This is a two-cost card that grows to be a 4/4 if not dealt with quickly, especially in our deck. Keld wants you to empty your hand as fast as possible before you cast it—and this is more upside for that plan. The fact the mana he produces can sometimes be used to instant-speed a Risk Factor or a lethal burn spell is delicious. Those are the big three, but, we’ve got to fill out a 60-card roster. So, let’s go over the rest quickly. 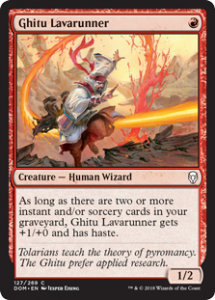 Fanatical Firebrand comes in as the obvious one drop alongside Ghitu Lavarunner. 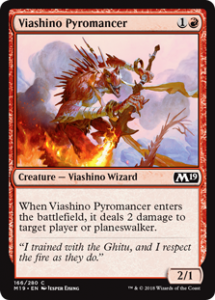 Viashino Pyromancer is still a shock with legs and works fine. 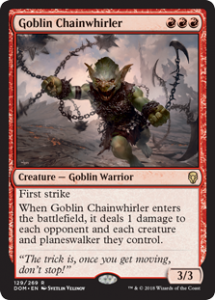 Goblin Chainwhirler is the best mono-red creature in standard and would be stupid to not include. 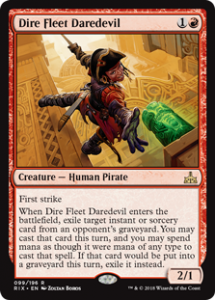 Dire Fleet Daredevil can aim back removal, burn, and can exile away enemy jump-start spells or potential Mission Briefing targets. As to our burn package, it’s normal: Shocks and Lightning Strikes. Depending on land count and how many Risk Factors are in the list, there’s room for one or two creative touches. 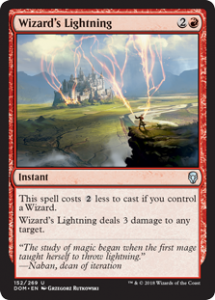 Now that we’re only running 8 wizards, Wizard’s Lightning loses some of its potency, but might still be the best option. 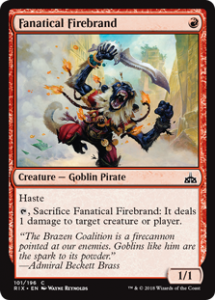 A main deck Banefire is something I have a soft spot for—but it’s likely a bad idea. 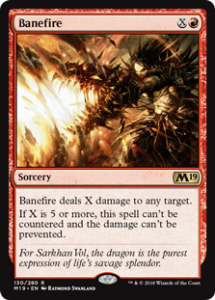 Speaking of Banefire and where it should be, the sideboard is a puzzle. 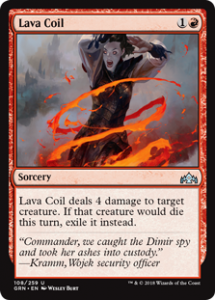 I’m confident Lava Coil and Goblin Cratermaker and Fight with Fire are all going to see some use—but I’m not sure how many of each. Also, while this deck is streamlined by being mono-colored, using shock lands for splashing in the sideboard may become meta required. Honestly, I am super excited about this new list. 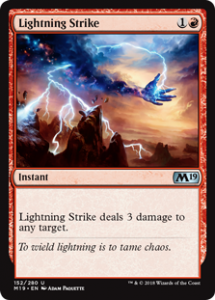 I really think, thanks to the damage everyone will be taking from shock lands for those multi-colored cards, and the inevitable slower midrange strategies that come with that environment, a deck that rushes in and punishes both the 2 damage or the tempo loss of letting lands enter tapped is a viable, competitive strategy. 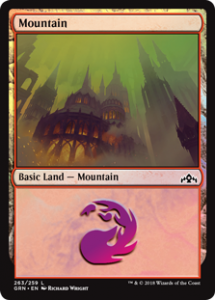 Remember, don’t overlook how powerful mono-color strategies can be even in a multi-color plane like Ravnica. Just because you don’t have a guild, doesn’t mean you can’t defeat your opposition.